Talk Like a Pirate Day is September 19th! “What is Talk Like a Pirate Day?” you ask? Well, it’s a holiday that two guys from Oregon made up just for fun, but it caught on and is now celebrated by the masses. You can do as little as wear a pirate-inspired accessory for the day or say “Arrr, mateys!” a few times, or you can go all out in full pirate garb and even change your Facebook language to pirate! Kids can get in on the fun too. 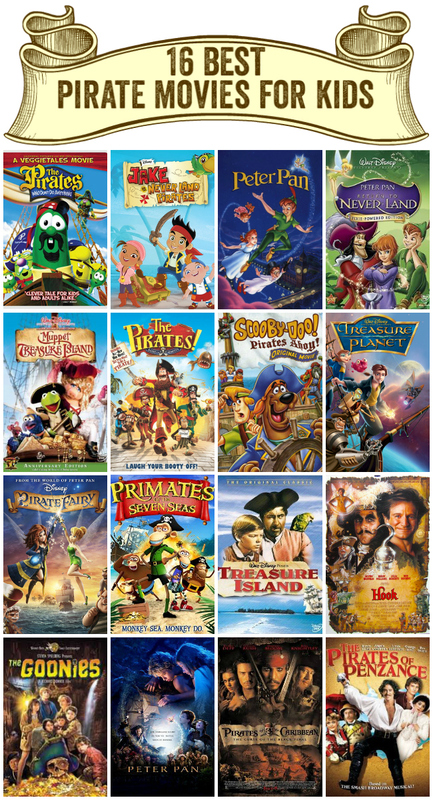 After school, have a piratey movie night (or afternoon) with some fun themed snacks and a flick from this list of our top 16 best pirate movies for kids! We’ve split it up by age, since different movies have different levels of appropriateness. If you have multiple children at multiple ages, it’s best to aim it to the youngest child. Since this year’s Talk Like a Pirate Day falls on a Friday, you can put the littlest ones to bed and let the older kids stay up late to enjoy a movie that you’d like to watch too. Put the deck-swabbing on hold and enjoy a fun night with your crew. The Pirates Who Don’t Do Anything: A VeggieTales Movie – Music, animation, silly characters and a great lesson make this movie perfect for little ones. It’s everything you love about Veggie Tales – but with pirates! Jake and the Neverland Pirates – While it’s not quite a movie, there are plenty of episodes on Netflix to watch these pint sized scallywags all day long. And your little landlubber will be learning instead of looting. Disney’s Peter Pan – This classic, while not totally about pirates, has lots of pirate action with one of the most famous captains of all – Hook. Peter Pan: Return to Never Land – Join Pan and Hook and the rest of your favorite Peter Pan characters in this fun sequel. It’s a little more piratey than the first! Muppet Treasure Island – A fun take on the classic tale. Much more upbeat than the original, and of course it has all the crazy muppet shenanigans! The Pirates! Band Of Misfits – Another fun underdog story, in claymation! Watch as these zany pirates compete for Pirate of the Year and craziness ensues. Scooby-Doo in Pirates Ahoy! – Scooby-Doo is best known for solving ghostly mysteries, and on a cruise through the Bermuda Triangle Scooby and the gang run into some ghost pirates – can they solve the mystery? Disney’s Treasure Planet – Another twist on the Treasure Island story that takes place in space. Disney’s The Pirate Fairy – Another spin-off of the Peter Pan universe, it focuses on Tinkerbell and her friends, but there is plenty of pirating! Primates of the Seven Seas – A silly story about a do-gooder who finds himself teaming up with an unlikely group of scallywags. Treasure Island – The original classic story of hunting for treasure with Long John Silver. Hook – A classic Robin Williams movie where we find out what happens when Peter Pan leaves Neverland. The Goonies – An 80’s flick that every kid must see. While the kids aren’t exactly your typical pirates, their search for treasure is an adventure all its own. Peter Pan (Live Action) – A great take on the Peter Pan story for kids who may not be into the animated stuff. Pirates of the Caribbean: The Curse of the Black Pearl – While there are quite a few sequels, this first movie in the POTC series is the most family-friendly. The Pirates of Penzance – This movie will probably appeal most to older kids, or kids who enjoy campy musicals, like West Side Story. 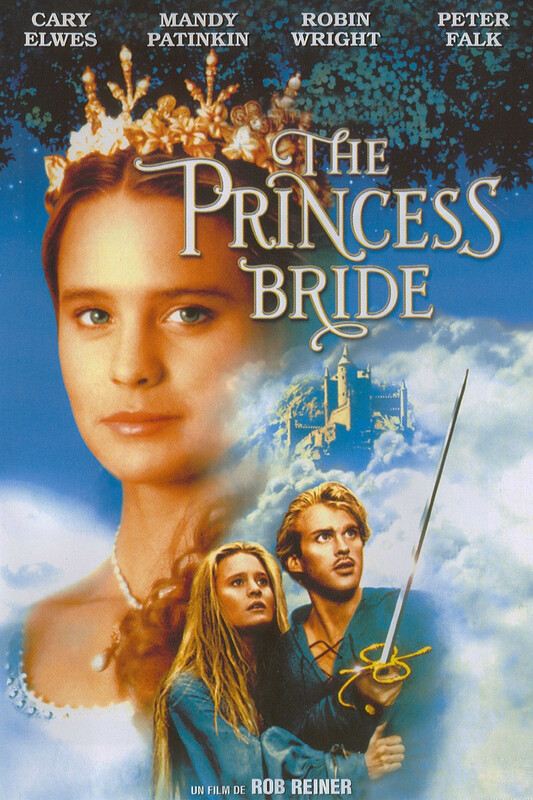 The Princess Bride is a movie you should be watching pretty much weekly anyway, but it’s totally appropriate for Talk Like A Pirate Day too! Hope you found one that you like! Grab some grog and batten down the hatches and have a great Talk Like a Pirate Day!